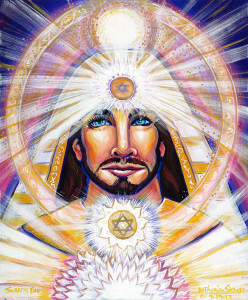 Portrait by Katherine Skaggs and she explains her work as follows: “Serapis Bey is an Ascended Master of Ancient Wisdom and a member of the Great White Brotherhood (a group of enlightened beings who serve humanity in its evolutionary path). When I was asked to paint Serapis Bey, I could feel his ancient Atlantean and Egyptian energies that I recognized too well. I am reminded that he initiated me into the Temples of Sacred Fire when he was a high priest of Atlantis, who migrated to Egypt at the time Atlantis was destroyed. Serapis also had incarnations as the Egyptian Pharaoh Amenhotep III and other famous incarnations as Confucious, Plato and Lucious Anneus Seneca to name a few. His collective wisdom and light was so bright when I sat to paint him I felt bathed in golden sunlight on the most beautiful summer’s day. Infused within this golden, solar, Christ light was the pure white light of the highest frequencies of the kundalini light, and the white light of the I AM consciousness. It was clear to paint Serapis with the infusions of Atlantean and Egyptian outer garb, reflecting the deep, ancient mystical spiritual encoding activates the timeless wisdom teachings of all knowing. The radiant light circles or rings are each portals and points of activation for star codes to unlock the powers within the light strands of DNA. In the circle of golden light around Serapis Bey’s head are spirals of light representing the DNA, which also have inscriptions of star code symbols. This circle of light connects the upper circle of light above Serapis Bey’s crown with the circle of light with the six-pointed star at his throat chakra. This activates and radiates high frequencies of harmonizing light from the eighth chakra into and through the throat chakra, assisting in activating the full expression of the Christ light. The circle of light with the six-pointed star in the center at the third eye area is a radiant point of light also activating higher consciousness, acting as a beacon and activation of high frequency light consciousness. These expansive energies of high frequency light symbols and star-light encodings bring clarity and strength of vision. Expect this infusion of high frequency light to support you in clearing the past and cleansing at deep levels so you can be born anew into these frequencies and higher consciousness. Serapis Bey is also known as the master or Chohan of the 4th Ray of Purity in the hierarch of the Ascension Temple at Luxor. The bright white light that Serapis Bey expresses in this painting is representative of the ascension flame and white light of the Mother in the base of the spine. From this white light comes foundational structures of higher Self. Expect Serapis Bey to be a great disciplinarian who will assist you in mastery of your earthly life. Ask him into your heart and into your life to transform and transmute any negative patterns you need mastery over.